Putting your Vend Plan on Hold ("On Ice") – How can we help? Please note that Vend’s pricing plans have been updated. If you’re looking to reactivate your account that was On-Ice, you will need to upgrade to one of our latest pricing plans in order to do so. Vend offers an On-Ice service, which allows you to put your account on hold temporarily. While your account is On-Ice, we retain all your store data until you're ready to use your account again. Important: While your account is on-ice, you will not be able to access your data. However, the data will be saved and you will be able to access your data once you take your account off hold. 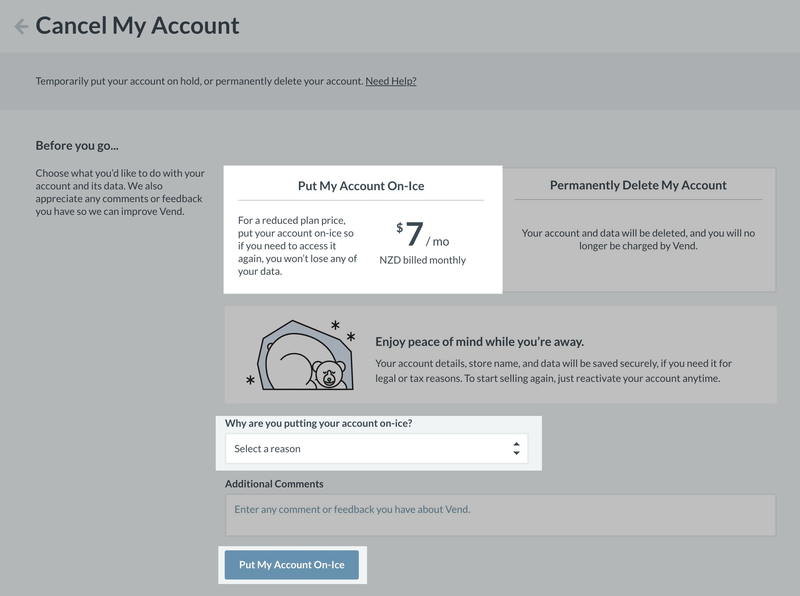 If you need to access your store data while your account is On-Ice, you may want to complete the steps below before you put your account On-Ice. Once you've exported all your data, you are now ready to put your account On-Ice. Important: If you have a Xero account, you will also need to make sure that all of your register closures, on account sales and stock orders (if applicable), are successfully posted to Xero before putting your account On-Ice. If you would like to put your account On Ice head to Setup in the side navigation menu. Select Billing and Cancel My Account. Next, select Put My Account On-Ice. You will then be asked to provide a reason and additional comments. Finally, select Put My Account On-Ice. The On-Ice service costs US $5 / NZ $7 / AU $5 / UK £5 per month. Note: Coupon discounts do not apply to On-Ice charges.When you reactivate your account after going On-Ice, you’ll be prompted to reactivate on one of our latest pricing plans. Once you are ready to reactivate your account, log in to your Vend store, and click on Reactivate My Account.